Marinade the Calamari rings with Knorr Coating Mix - spice marinade (100g) for 20 minutes in a refrigerator. Make batter by mixing Knorr Coating Mix – Coating Base powder (60g) and wheat flour together and sieved twice to a Tray. 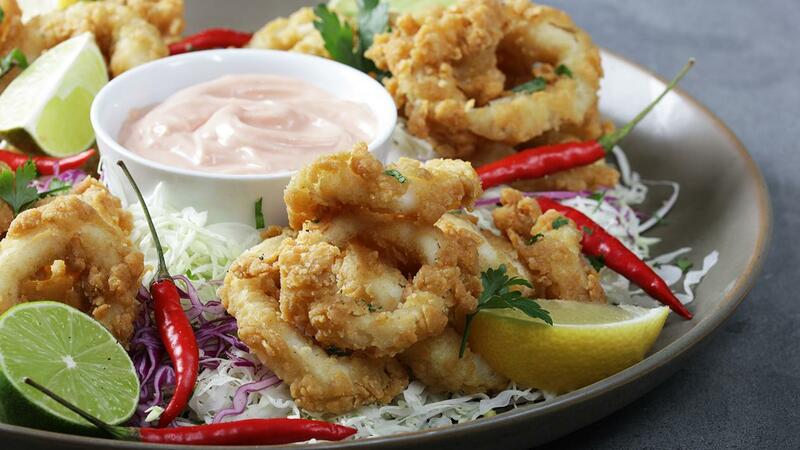 Dip the marinated Calamari rings in the batter and deep Fry at 180°C until golden brown. Combine shredded carrots and cabbage with Hellmann's Classic Mayonnaise also add freshly chopped mint and a little Knorr Lime Seasoning. Once calamari is fried sprinkle and season with Knorr Aromat Seasoning and Knorr Lime Seasoning.